As the October sun sheds its last rays of warmth, a flock steps over the hill into the light. 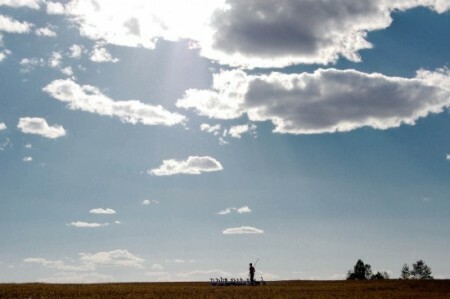 Their herder, a woman in blue jeans, guides the ambling troupe beyond the shadows of hay mounds and sheet metal to glean in fields of freshly harvested barley. She shoulders a long smooth staff like a loaded gun. The only sound is the crunch of golden stubble under her feet. Her herd — of geese, not sheep — traipse silently on webbed feet. 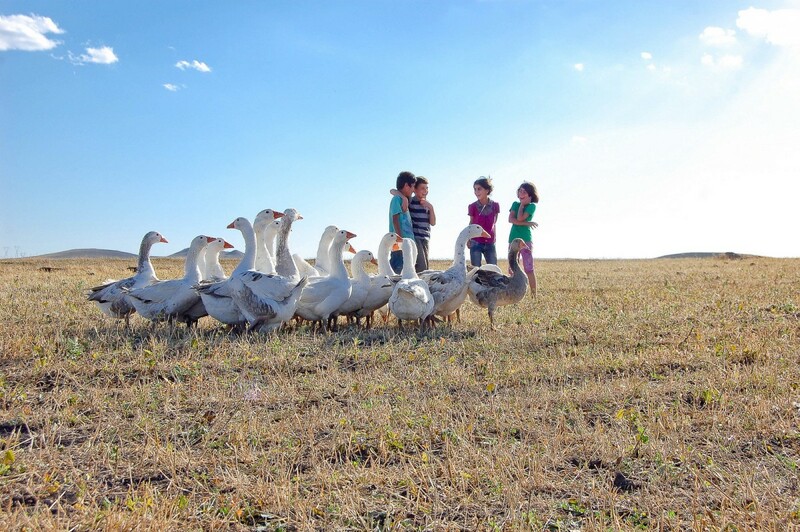 In the village of Cakmak, just beyond the old castle walls of Kars in far northeastern Turkey, the tradition of herding geese goes back centuries. Throughout the unfriendly winters of the southern Caucasus Mountains these birds have long been a means of survival. By October’s end their bodies will drape from rope and rafter in every village, preserved only by salt and natural refrigeration. The birds are winter’s store. But the geese are beginning to serve a different function in this region that has long had a nasty reputation as a place where women face repression and few prospects for work and empowerment. As if in a migratory V-formation, the geese are trailing on the wings of a restaurateur and visionary named Nuran Ozyilmaz, who is tapping the geese of Kars to create new opportunities for beleaguered Turkish women. Such self-confidence betrays cultural norms for women in northeastern Turkey. In Ozyilmaz’s case, these boasts are warranted. Her efforts are gradually transforming Kars and surrounding villages, turning the centuries-old practice of goose herding into a profitable enterprise. “My goal is to initiate women into the workforce,” says Ozyilmaz, now 56. Her brown eyes are resolute. She wears a loose burgundy scarf and dangling gold earrings suggestive of a blithe wanderer. When she talks about the dozen or so employees at the restaurant her full, ruddy cheeks reflect pride and satisfaction in her accomplishments. Beyond the walls of her modest eatery, in villages like Cakmak, Arpacay, and Kumbetli, Ozyilmaz teaches women how to raise geese. Now, she is proud to say, women who want to put their kids through school are selling their geese to her at around $50/each. A visit to a village crystalizes both the potential and need for Ozyilmaz’s venture. Up the hill north of Kars beyond the ancient fortress and past trolling military tanks rests the listless community of Cakmak. In the surrounding pastures, young children chase pecking geese through newly shorn barley. Women, modestly covered in scarf and soot, labor over wood-burning stoves. Stone, mud, and concrete homes are scarcely enough to keep out the coming frost. Two men shore up a metal roof in preparation. Idris Kadiran, an elder in the village, explains to me some about the local farming of the Kafkas (Caucasus) geese. They are raised here from hatchling to adult. Their feathered necks are painted blue, red, yellow, or green to mark ownership. They are slaughtered at eight months of age. The breed does not migrate and is significantly smaller than European stock. Most are not pure white but speckled in shades of brown and gray. “After the snow falls they taste especially good,” Kadiran tells me as he follows a herd of cackling fowl through a burbling stream. Kadiran say that he raises the geese for his family. If he has any extra, he sells them to people like Ozyilmaz. At Ozyilmaz’s restaurant, goose is served in the local tradition and simplest possible form to accentuate the natural flavors. Slow-roasted until the fat is melted through, the dark meat is served on a bed of light bulgur flavored in drippings. With a texture reminiscent of pulled pork, tender and somewhat stringy, the meat is much like juicy duck. But the dish is pure goose. Ozyilmaz says she is proud of the local product, and the fact that her organic geese are untainted by sauce or spice. Her restaurant is a buzz in the community, and increasingly with tourists. The Kaz Evi has garnered local and national attention in the press. The United Nations has recognized and awarded Ozyilmaz’s efforts in community development. 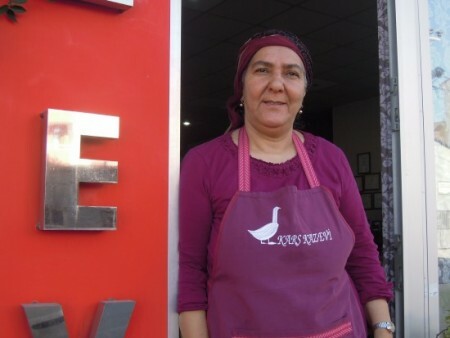 Other women have seen Ozyilmaz’s vision and are opening their own goose restaurants in Kars. In a region with staples such as lamb and chicken kebabs, warm soups and stews, the restaurant culture is being reinvented. As tourists flock to experience Ozyilmaz’s goose, other establishments are craving some of the business. Goose pizza, goose kebabs, and goose stew are being added to the menus of other dining locales. Ozyilmaz says that her next project is to export her restaurant model and menu to the megacity of Istanbul. “Now there’s enthusiasm, a new trend,” she says. “We’ve created demand, but it needs to grow.” Her ultimate goal, she says, is to develop an industry around Kars’ geese. After a visit to Hungary, a country famed for its goose liver, Ozyilmaz’s entrepreneurial eyes are open again. While in Budapest she witnessed everything from farming techniques to stores that sold feather products. If the region of Kars is to tap into the true potential of the goose, Ozyilmaz knows they will need to start processing down feathers. By developing a farm or factory for feathers her hope is to put even more women to work. Brian McKanna is a regular contributor to EthnoTraveler.